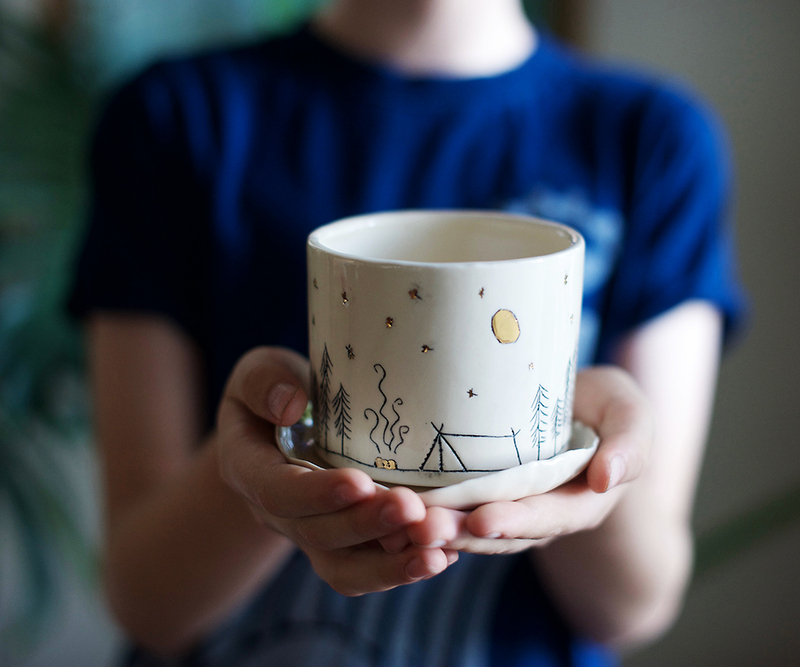 Meet Gemma Troy the Australian ceramist behind Trinka. Gemma is based on the Sunshine Coast Australia and creates ceramics that are elegant, unique and display a magical touch of whimsy. I fell in love with ceramics as I chased another creative adventure. Always willing to give anything a go, I purchased a second hand kiln toward the end of 2015 and taught myself. Not long after Trinka was born. Working from my home studio, I make everything by hand using porcelain clay. Inspired by my childhood and love for fairy tales and children books, my work is adorned with handmade sketches of moonlit skies and pine tree forests with touches of gold that evoke a sense of magic. I start my morning with a hot chocolate in my hammock on my verandah. Then I'm flat out with getting my son ready for school. Supervising his piano and cello practice and making sure homework is done. When I get back from school drop off. I usually sit and have a snack before going to my studio to work. I have taken a break at the start of this year. Towrds the end of 2016 I was so busy and so stressed out. It has been great to have a rest for awhile and focus on family. I'm now ready to dive back into work and have a fantastic 2017. Yes it was at my first markets. It was cold and raining and I was getting ready to pack up after a very disappointing day when 4 women showed up . They were all friends and they just fell in love with my work. We chatted and laughed for about 30 minutes before they nearly bought up my whole stall. I have been asked to be part of an amazing bunch of makers for Markers for refugees hosted by Pip Wilcox Ceramics. Every week an artist will auction of their work and all proceeds will go to this fantastic charity. My week is the first of July and I'm already working on some new pieces especially for it. I had a group of friends that wanted to buy my creations for Christmas presents. I got so much enjoyment from selling and the feedback I recieved was so positive it inspired to me to start selling. Well I'm not organised at all. My Instagram account is probably the most organised part of my whole business. That it is ok to put family first. This is probably the most difficult thing I struggle with. I keep pushing through. Usually there is compliment or a sale just around the corner and this lifts my spirits again. I also like to write poetry and I have this drawing of a girl with fairy wings who was inspired by one of my poems. I have started re creating her on my ceramics and I'm in love with her. I'm so excited to see what else she inspires me to create.